Anthropogenic climate change can best be described as an abnormal increase in the global surface temperature due to emission of greenhouse gases by human activities. While the climate has been changing since the emergence of Planet Earth in the solar system, human activities in recent times have accelerated the pace of this change. It is now common knowledge that the concentration of carbon dioxide, a significant greenhouse gas (GHG), has consistently increased since the industrial revolution. Interestingly, what fueled the industrial revolution is precisely what is fueling anthropogenic climate change today. Coal, which is more popular as a thermal energy source or a fossil fuel, is actually excess atmospheric carbon dioxide which was captured and stored deep in the Earth’s crust through natural processes millions of years ago. Indirect data and direct measurements from ice cores reveal that the ‘pre-industrial’ concentration of carbon dioxide level in the atmosphere was around 260–270 ppmv . Carbon dioxide concentration in the Earth’s atmosphere between 2010 and 2014. (Data source: noaa.gov)Our dependence on coal and other similar fossil fuel has made us mine and extract this stored carbon dioxide from the Earth’s crust and burn and release it back into the atmosphere. This exercise is continuously ongoing since the advent of the industrial revolution in late eighteenth and early nineteenth century. Consequently, the concentration of carbon dioxide in the Earth’s atmosphere reached 350 ppmv by the year 1989 . The last two years have been even more concerning and the May of 2013 sounded the alarm bell. 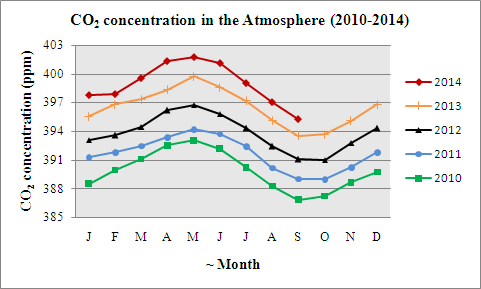 The concentration of carbon dioxide in the atmosphere touched the 400 ppm mark in May 2013, as can be seen in the figure above. The carbon dioxide concentration crossed the 400 ppm mark in the present year (0f 2014) and going by the visible trend, will continue to do so in coming years. Despite this alarming trend, we continue to rely on extracting and burning fossil fuel. It should be noted here that while the science is now absolutely clear that global warming is leading to accelerated climate change, the impact of this change cannot be predicted to spatio-temporal certainty. This is largely because the global climate system is complex and the biosphere (that part of Planet Earth which supports life) is not very easy to model. What we know for certain is the fact that climate change is going to impact us all, in ways that we may not understand or be able to predict. The above has huge implications for cities and urban agglomerations. First, large cities are responsible for global warming due to the polluting processes and large demand of these urban centres. Mega cities are therefore also major contributors to climate change. Cities cover less than 2% of the Earth’s surface, but consume 78% of the world’s energy and produce more than 60% of all carbon dioxide and significant amounts of other GHG emissions, mainly through energy generation, vehicles, industry and biomass use . Second, by inhabiting millions of people in dense concentrations, cities are themselves most vulnerable to the impacts of climate change. Rising sea levels, increased precipitation, inland floods, more frequent and stronger cyclones and storms and periods of more extreme heat and cold. Cities are not new to climate change and warming. Urbanisation accompanies land cover change from open spaces and vegetation to buildings, roads, pavements and concretisation. These changes cause urban centres to become warmer than their rural surroundings, forming an “island” of higher temperatures in the landscape which is known as an ‘Urban Heat Island’. The annual mean air temperature of a city with 1 million people or more can be 1–3°C warmer than its surroundings. On a clear, calm night, however, the temperature difference can be as much as 12°C . A warmer global climate will also result in urban heat islands with even higher temperature. The science of climate change is now as articulate as it can be. The predicted impacts of climate change may not necessarily match the natural forces that prevail. Urban centers, which are actually a highly dense population of the human species, are under a direct and obvious threat. However, much is not being done to either contain the causes of climate change or increase urban capacity to mitigate and adapt to the perceived impacts of climate change. This needs to change and municipal agencies, policy makers and urban ecologists need to draft urgent strategies for assessing and increasing the resilience of all our bigger urban centers. NOAA. 2014. Carbon dioxide time series data. Accessed from noaa.gov on 7 October, 2014. UN-Habitat, 2014. Climate change. Accessed from unhabitat.org on 7 October, 2014. EPA. 2013. Basic Information – Urban Heat Island. Accessed from epa.gov on 8 October 2014. NextInvite to Panel Discussion on Do Tigers Drink Blood…?